Countless clients have entrusted me on how they’re going to be represented through my logo designs. Check out my works and witness how accurate and inventive everything is. 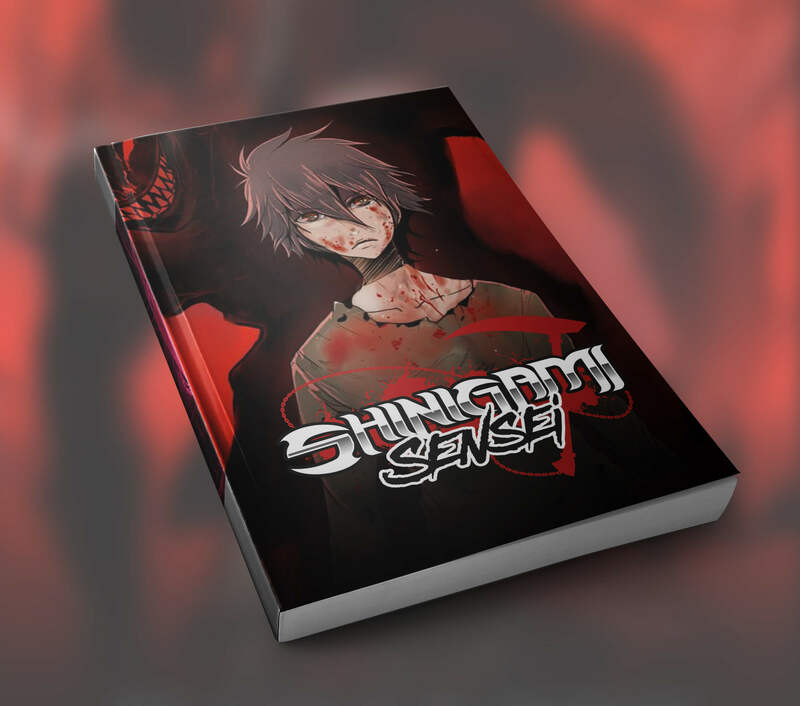 Shinigami-Sensei is commissioned by Hisham Najem from Kuwait, as a logo for his Manga comics under the same name. The Manga has a very dark story involving Demons and war. The client wanted to have blood and Scythe in the logo so I incorporated it in but I don't want it to be over the top so I made it a subtle silhouette in the background. You can read the Manga at Shinigami-sensei.com. It's a good read and free for everyone to enjoy. A client wanted to redesign an illustration of Nagafen, the official dragon of Ever Quest 2. They used this illustration for their website, social media, and many more. Ever Quest designers always listen to the players’ suggestions, that’s why they easily acquired loyal fans through the years. The Ever Quest team tweeted us that they wanted to use my artwork as their inspiration. They even promoted my artwork on their main website. See the behind the scenes look of the process here. I was approached by a start-up company to come up with a logo design for their new game, a game which can be played on both your phone and your computer. I find this game very interesting. There, you’d have to take care of a wolf as if it’s your pet. Then, as it grows stronger, you can play it against other wolves. Through their strong concept, they have managed to get thousands of players interested. I’m happy this game continues to thrive, even with the endless competition in the market. See why thousands love it and check this game out at wulves.com. A UK-based client contacted me to make a logo for his baseball player son. There, he wanted his son's initials and number, BPS and 10. The client gave me lots of reference images to review. He also left the colors up to me, but I still ran my plan through him beforehand. He was very involved in the process, and I enjoyed our collaboration. The outcome being based on the reference images, he was superbly impressed by it: BPS carefully placed on a sharp-edged shield, with 10 in the middle. Topping it off is the crown above everything. Finally, it was printed on his son’s shirt. Nothing makes me more proud than seeing my works being shown off to the world. The client had some awesome ideas about the logo of his indie game so he contacted me to turn these into reality. As the client wanted to have a spooky mascot in the logo, it became the main element of the final design product. On top of that, I added the sword and shield at the back of the main element since they are an important part of the actual game. All in all, the logo successfully encapsulated the important elements of the game. The Untold Legacy was successfully launched and the game immediately caught on with gamers everywhere. The client was pleased. Visit them on the-untold-legacy.com. Buckets of Whimsies represents an illustrator specializing in children’s book illustrations. After brainstorming on the theme of the logo, I immediately went to work on the concept. I decided to incorporate the client’s personality and natural love for cats. I put her cat with the client behind a wood board to match her website’s background. Since the website had a naturally childlike feel, I decided to make the letter “U” of the main text as a bucket overflowing with stars. The logo turned out to be what the client had visualized and we were both pleased with the results. You may visit her site at bucketsofwhimsies.com. A client approached me with an idea for a web browser simulation game about the gangster life. He wanted me to handle the overall design of the game, including web design, UI, UX, and of course the logo. The game was basically about the street life of a gangster dealing drugs, weapons, and counterfeit money. The client wanted a logo with dark red and gold as its main colors so I designed it in such a way that it reflected the everyday badassery of a true gangster – dark and mysterious, yet always with a certain panache to it. The website also had the same theme outcome as the logo. Crazy Monkey Studios is a company that produces games for Steam, Windows, Apple, Xbox, and PS4. Their over-the-top and fast-paced game Guns, Gore & Cannoli was a hit among gamers immediately after its launch. Before the release of the best-selling game, the company contacted me for the project. Crazy Monkey Studios were in need of a logo and mascot that would best represent what they do. Since Crazy Monkey Studios is all about games and awesome craziness, I designed a crazy Viking monkey clad in various gaming accessories like a shield, sword and a Viking helmet. The final design turned out perfect as it represented what they offer. Visit their website at crazymonkeystudios.com.